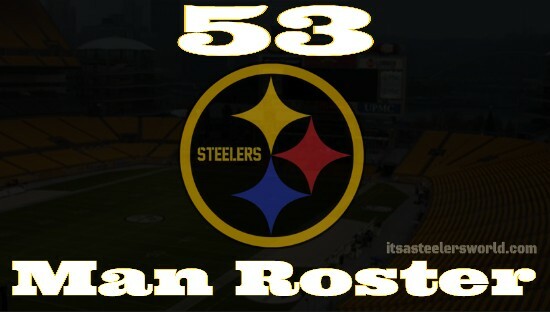 IASW: Pittsburgh Steelers 53 Man Roster Prediction | "IT'S A STEELERS WORLD"! With Week 2 of the Pittsburgh Steelers preseason wrapped up, I have comprised my evaluation and prediction for the 2015-16 53 man roster. So without further delay..let’s get it started. QUARTERBACK: Ben Roethlisberger, Bruce Gradkoswki, Landry Jones: Yes, I am tossing Landry Jones into the mix on this one. Although he played horribly in the first two preseason games, his two touchdowns in the 4th quarter landed #3 in my book. With the release of Tahj Boyd and little looks at Tyler Murphy, Jones gets the nod. WIDE RECEIVER: Antonio Brown, Markus Wheaton, Martavis Bryant, Darrius Heyward-Bey, Sammie Coates: Brown, Bryant and Wheaton make up one of the most talents wide receiver corps in the NFL. Coates, a 3rd round pick will make the team, but some to think that we need to cut Heyward-Bey. The problem with those “some” is they don’t understand receiver value. RUNNING BACKS/FULLBACK: Le’Veon Bell, DeAngelo Williams, Josh Harris, Dri Archer, Will Johnson: Bell, of course will miss the first two games but even with those games missed will once again be one of..if not the best running back in the league. DeAngelo Williams is a solid backup, solid free agent pick up and will fill in sufficiently. Josh Harris, although injured slightly is serviceable. Dri Archer, out to make it a comeback year should do just that. Will Johnson gets the nod for the fullback role. TIGHT ENDS: Heath Miller, Matt Spaeth, Jesse James: Miller is aging? So what! Dude is still a monster at the tightend position. And in my opinion, one of the most underrated players in the National Football League. Spaeth has been there before with the Steelers, and understands what it takes to succeed. James, although had two pitiful bobbles in the HOF game beats out Cameron Clear for the last slot. OFFENSIVE LINE: Kelvin Beachum, David DeCastro, Maurkice Pouncey, Ramon Foster, Marcus Gilbert, Cody Wallace, Chris Hubbard, Alejandro Villanueva*: The offensive line really started to gel last year and all the starters are returning. Cody Wallace will be the backup center. Chris Hubbard should be the backup guard and ex- army ranger Alejandro Villanueva takes the place of the injured Mike Adams. DEFENSIVE LINE: Steve McLendon, Daniel McCullers, Stephon Tuitt, Cameron Heyward, Cam Thomas, L.T. Walton: This unit will be substantially better than it was last year with the emergence of Stephon Tuitt. McCullers development will be worth watching. Walton and Thomas can both play DE and DT and show value when we go to a four man front. Walton is the wild card here, With the injury to Clifton Geathers he just has to show that he deserves this spot over Ethan Hemer. OUTSIDE LINEBACKER: Arthur Moats, Jarvis Jones, James Harrison, Bud Dupree, Anthony Chickillo: Moats and Jones are penciled in as the starters. Harrison is 37 years old and still a valuable backup in most people’s eyes, but a viable starter in my book. He will have his snaps minimized to 20-25 to keep him healthy and active all season. The plan is for Dupree to be our OLB of the future and he can learn behind the underrated Moats until he develops. Since Jordan Zumwalt’s release Anthony Chickillo has done enough to deserve the fifth spot over Howard Jones. INSIDE LINEBACKER: Lawrence Timmons, Ryan Shazier, Sean Spence, Vince Williams, Terence Garvin: Timmons and Shazier are going to be exciting to watch this year, and are elite athletes. Vince Williams and Sean Spence can rotate in without a drastic drop in talent. Terence Garvin could take the last spot due to his value on special teams. CORNERBACK: Brandon Boykin, Cortez Allen, William Gay, Antwon Blake, Doran Grant, B.W. Webb: Brandon Boykin..what can I say? By far the smartest move that the Steelers made this off season next to DeAngelo Williams. He will be a major contributor early and often. Allen needs to bounce back from a horrendous 2014 season. Although Gay will probably will start the season, he could be moved inside if Allen and Boykin play strong. Dorant Grant shows promise and will be given every opportunity to grow into the position. Senquez Golson is out with a shoulder injury and B.W. Webb beats out Kevin Fogg for the last slot. SAFETY: Mike Mitchell, Shamarko Thomas, Will Allen, Robert Golden: Mitchell, Thomas and Allen are all locks. But with Thomas’ play today, he may see more playing time than I originally expected. Golden gets the last slot though I wouldn’t be surprised if the Steelers don’t opt for a younger player like Ian Wild(who came up on a nice sacj today) or Alden Darby.